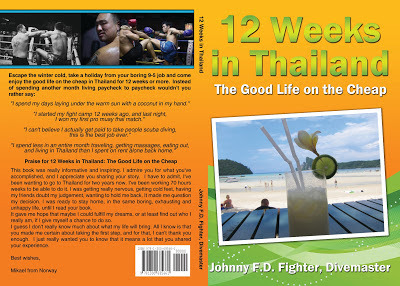 My 3 Month Fight Camp in Thailand: Paperback version of 12 Weeks in Thailand: The Good Life on the Cheap now on Sale. 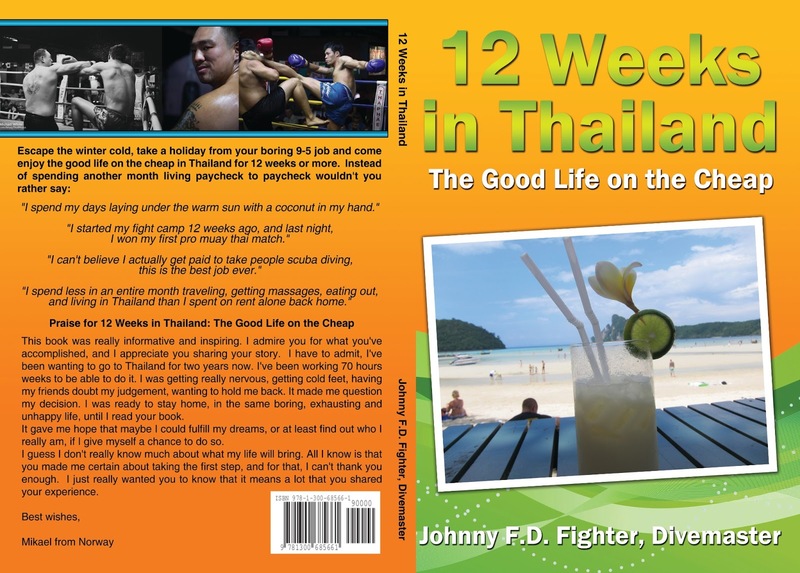 Paperback version of 12 Weeks in Thailand: The Good Life on the Cheap now on Sale. I'm very excited to share the news that my new book, 12 Weeks in Thailand: The Good Life on the Cheap is now available in Paperback! That's right, you can order it and have it shipped to your home world wide and enjoy it as a physical book! However, the eBook may still be a better idea and it's definitely a better value and here's why. With the eBook you can download it instantly, providing you with instant gratification Buy it today and read it tonight. 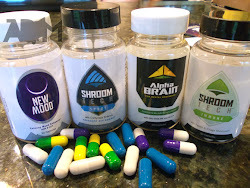 You can load it up on your iPad, tablet, computer, or even read it on your phone like my friend Nic has been doing every night before bed. The eBook is also cheaper, and since it's digital delivery, it's basically free shipping. However, I know some people like having a physical book in their hands and don't mind waiting the 1-2 weeks to receive it. Plus it's kind of cool seeing my book in print, so if you're old fashioned, you are more than welcome to buy the book in paperback. The retail price will be $34.99 plus shipping, but for a limited time it's 15% off and only $29.74 plus shipping. I had just finished reading the book and recommend it as an enjoyable novel to read about an American who goes after what he wants in life and has some adventures doing it. Also if you are wanting to go to Thailand it is a must have. I enjoyed it. The book is great! It's a perfect guide on Thailand, ideal for someone who's planning on going there to train and explore. I'm planning my trip and it really helped me with preparations, outlining what stuff to bring, what to look for when there, what to buy, etc. I really like how you open up and give personal experiences, with which I think many can relate. I also like the personal interesting and amusing stories of hookups and such! It does give a certain boost to make that leap and finally go there and do what you dream about. Thanks! Once again, thank you to everyone who finished reading the book so far and left reviews, they really mean a lot to me to know that you guys are enjoying the book and getting a lot out of it. The first review of 12 Weeks in Thailand I received is still the most inspiring and made me instantly know that it was the right thing to do writing this book. I told myself that if my book even helps one person, it'll make all the hard work and effort worth it. Also thank you to all of my friends that bought the book, it means a lot to me that you guys read about the last 4 years of my life, and my journey. To everyone who bought the book, thank you for supporting my fight camp. A portion of all book sales will continue to go to DonorsChoose.org which is a non-profit helping local teachers and education. "Hi, I just finished reading your book. It was really informative and inspiring. I admire you for what you've accomplished, and I appreciate you sharing your story. I have to admit, I've been wanting to go to Thailand to train for two years now. I finally decided to go last October, and I'm leaving 31/01/13 - to stay for six months. I've been working 70 hours weeks to be able to do it, and my shape isn't that great. I was getting really nervous, getting cold feet, having my friends doubt my judgement, wanting to hold me back. It made me question my decision. I was ready to stay home, in the same boring, exhausting and unhappy life, until I read your book. It gave me hope that maybe I could fulfill my dreams, or at least find out who I really am, if I give myself a chance to do so. I'm a really shy and introverted 22 year old man, so I guess I don't really know much about what my life will bring. All I know is that you made me certain about taking the first step, and for that, I can't thank you enough. I'm terribly sorry for my poor grammar, and for writing your personally to thank you. I'm sure you have a lot on your plate. I just really wanted you to know that it means a lot that you shared your experience. If you'd rather save some trees, save some cash, and download the ebook digitally right now in pdf format onto your computer, ipad, smart phone, kindle, or tablet. Digital eBook now on sale for $24. 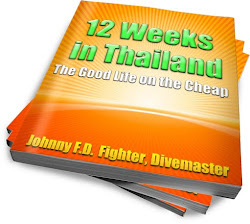 Author of 12 Weeks in Thailand: The Good Life on the Cheap. Edit: My Fight Camp just made our first official donation this morning. A local restaurant owner, who has never asked for help turns out to be in dire need of assistance. His wife has Leukemia (leukaemia) and they are in fighting to keep the restaurant open and his wife alive. Thank you to everyone who has purchased a book, without you donations like these would not be possible. Your book was pretty decent man. Helped me decide where i'l be training wen i get to Bangkok. Thanks. Hey Darren, glad you enjoyed the book. Best of luck and good luck training in Bangkok.